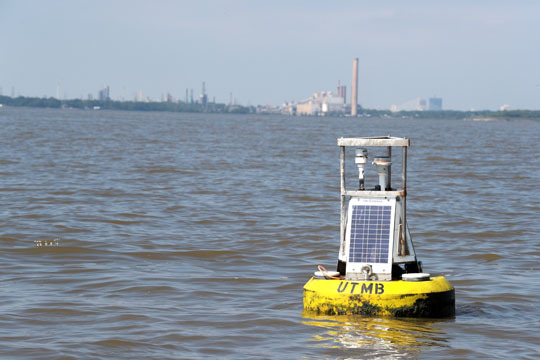 Scientists from nearly a dozen organizations throughout the region are visiting The University of Toledo Lake Erie Center Tuesday, May 15, to calibrate equipment that will be deployed in buoys across Lake Erie to measure water quality throughout algal bloom season. UT’s water quality and sensor buoy annually rides the waves off the shore of the Maumee Bay State Park Lodge and Conference Center in Oregon. Partners in the early-warning buoy network will do the calibration between 9 a.m. and 2 p.m. Those include researchers from Bowling Green State University and Ohio State University, as well as water treatment plant operators in the cities of Oregon, Toledo, Elyria, Avon, Sandusky and Lorain. LimnoTech, YSI and Fondriest Environmental are local companies providing technology support. UT’s water quality and sensor buoy annually rides the waves off the shore of the Maumee Bay State Park Lodge and Conference Center in Oregon. It is part of an early-warning network of buoys throughout the western Lake Erie basin that provides live data vital in the assessment of harmful algal blooms. The buoys are equipped with what is called the YSI EXO sonde, a black and blue instrument composed of several probes to measure various water quality parameters, including how much blue-green algae is present, water temperature, clarity, oxygen levels, turbidity and pH. It’s one piece of the battle plan to track and combat the growing harmful algal bloom in order to sound the early warning for water treatment plant operators as they work to provide safe public drinking water. “We are watching very closely and are prepared,” Bridgeman said. This entry was posted on Monday, May 14th, 2018 at 3:25 am and is filed under Events, Natural Sciences and Mathematics, News, UToday .